Memoirs of Michelle: I've been given an award! I've been given an award! Tan has given me this cool award...Thanks heaps Tan!! 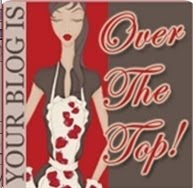 Okay so now you have to do this.....Right click "Your Blog Is Over The Top", save image to my pictures then copy and paste what is written below into your blog post! Then add the the pic to your blog and answer these questions! 12. Where do you want to be in 6 years? Not sure? I have some new Christmas cards up on Scrap n Craft with T's blog today. Using some really cute My Minds Eye papers and diecuts, called A colourful Christmas. A quick and easy tutorial with instructions for each card can be found on the blog! OMG...thanks sweet Chelle!! I possibly need to update the blogaroonie and have a little fun to boot!! Thanks chickie for the award! Don't think I'll get to upload before I head away for the weekend! Looking forward to scrappin' with you! See ya down the coast! !